This is my 2nd review of unlock & earn app.The app I'm reviewing today is Honeyscreen which like Slidejoy pays you for viewing sponsored content on your lock screen. I used Honeyscreen for two days and earned a mere of 9 points. Even on Playstore, you can see people complaining about this. The conversion rate is not the same as Slidejoy. While you can redeem 2000 Carats for $2 PayPal cash but you would need 2050 points for the same on HoneyScreen. The points are way too less than Slidejoy. Because on slide joy you easily earn 10-50 ($0.01-0.05) carats per day. You would be better off using Slidejoy over HoneyScreen. So, should you completely forget that Honeyscreen even exists? Well, even though the points earned by using Honeyscreen lock is close to nothing. It does offer other ways to earn points. 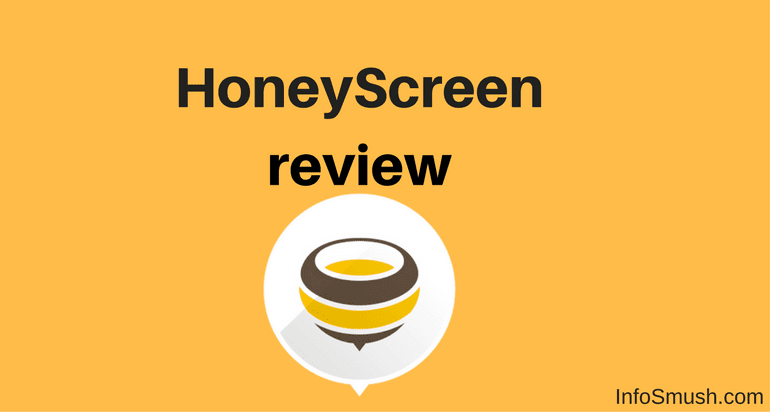 We'll talk about them later on in this review, but first, let's set up your Honeyscreen account. Download Honeyscreen from Google Play Store. Open the app and tap on sign up with Google and select your email with which you'd like to register. You can sign up using your Google, Facebook or with email. On the next screen fill in your DOB, select your Gender and enter this referral code: i5489z to get 300 coins instantly. Now that you are registered and got your 300 coins for being my referral, as promised, you'll learn how to earn points with Honeyscreen without enabling its lock screen. Complete offers from Fyber or Supersonic and earn more points. You can also earn up to 300 points for completing surveys. The longer a survey takes to complete the higher the reward is. The points you earn on Honeyscreen can be redeemed for Paypal cash, Mobile Top-up or Facebook, Hotels.com and 1-800-flowers.co gift cards. Earning from HoneyScreen's lock screen is almost nil. Slidejoy pays way more than it. But, if you can refer 10-20 people than you might be able to get more points. So, only use Honeyscreen if you can refer 5-10 users.